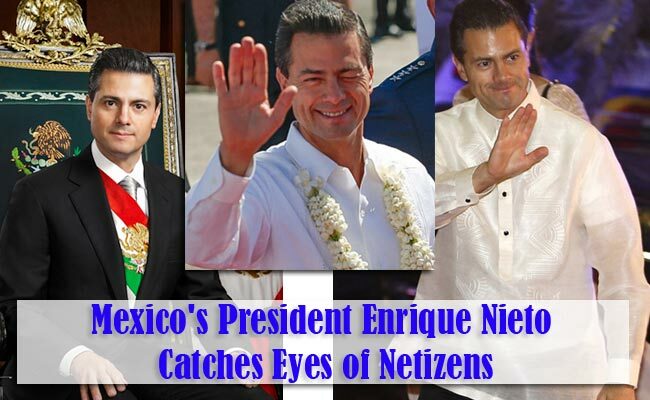 Despite various positive and negative issues on Philippines hosting the 2015 APEC Summit, netizens took time to appreciate Mexican President Enrique Nieto’s good looks. It has been reported that it was President Nieto who had personally asked Kris Aquino to welcome him back in the country. It was last year when the president first visited the Philippines and Kris Aquino took the responsibility to welcome and shoulder the diplomatic duties of her brother since President Ninoy Aquino was in Myanmar at the time. During the two hour pit stop to refuel his plane, he had first captured the attention of netizens with his charming looks. At the age of 49 years old, it is not bad for president Nieto to look fine. Born on July 22, 1966, his age does not show with his looks. While he might win the Filipino’ds heart with good looks and charm, his credentials will prove that he is just more than the good looks. Mexico’s president has a Bachelor’s Degree in Law and even an MBA from Instituto Tecnólogico de Estudios Superiores de Monterrey. In 2013 and 2014, Forbes listed him as one of the Most Powerful People in the World. Serving Mexico as a president until 2018, President Nieto is now at his third year of tenure. He begun his term in 2012 under the institutional Revolutionary party. Though some ratings might show his decreasing popularity among his constituents, his popularity in the Philippines is just getting higher on social media. The charming president is married to Mexican soap opera actress Angélica Rivera whom he met during a campaign. During his stay in the country, it is expected that his popularity will continue to generate interest in various social media.